Radio Free Asia (RFA) announces its 66th QSL card. This latest design commemorates the 2018 Winter Olympic Games in the city of PyeongChang, Republic of Korea, scheduled for February 9- 25, 2018. The Games always bring people together from around the world in peace and harmony to respect universal moral principles and the unique Olympic idea. 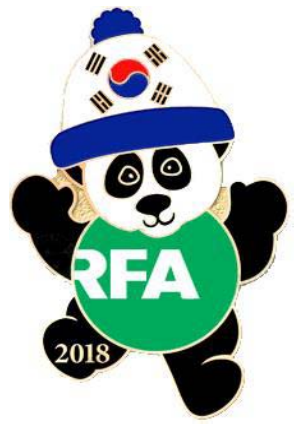 This fine new design shows an adaption of RFA's first panda QSL which was originally used for the 2008 Beijing summer Olympics. The updated version of the original panda design adds a winter cap stylized to match the Games. The winter cap is made in the South Korean national flag design. This RFA QSL design is used to confirm all valid reception reports from January to April 2018. Created by Congress in 1994 and incorporated in 1996, Radio Free Asia (RFA) broadcasts in Burmese, Cantonese, Khmer, Korean to North Korea, Lao, Mandarin (including the Wu dialect), Vietnamese, Tibetan (Uke, Amdo, and Kham), and Uyghur. RFA strives for accuracy, balance, and fairness in its editorial content. As a 'surrogate' broadcaster, RFA provides news and commentary specific to each of its target countries, acting as the free press these countries lack. RFA broadcasts only in local languages and dialects, and most of its broadcasts comprise news of specific local interest. More information about Radio Free Asia, including our current broadcast frequency schedule, is available at www.rfa.org. RFA encourages listeners to submit reception reports. Reception reports are valuable to RFA as they help us evaluate the signal strength and quality of our transmissions.